CRS Roofing Artisans - The premier wave-course, Steam-bent, Thatch and Cedar experts in the country. The premier Wave-course, Steam-bent, Thatch and Cedar roof experts in the country. Roofing Artisans can help you with your next Wave-course, Steam-bent, Thatch or specialty cedar roofing project. Roofing Artisans is the premier roofing wave-course, steam-bent, thatch and cedar expert in the country. For nearly 18 years, Roofing Artisans has been designing, project-managing and installing beautiful roofs for our customers. Contact us today, and we'll build you a roof that is guaranteed to last generations. This Storybook Home is located in the Upper Highlands neighborhood of Louisville, Kentucky. We were the favored out-of-state contractor because of our experience and incredible attention to detail. All material was steam-bent and hand-cut on site for a truly custom job. 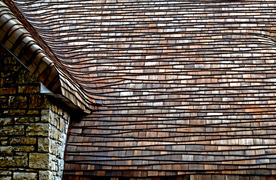 HEAVY-COURSING - THE PROCESS OF STACKING OR LAYERING THE CEDAR SHINGLES WITH A TREMENDOUS AMOUNT OF OVERLAP; IMAGE FROM ARTISAN PROJECT IN LOUISVILLE, KY.